Water, Cetearyl Alcohol, Mineral Oil, Glyceryl Stearate SE, Aloe Barbadensis Leaf Juice, Isopropyl Myristate, Cocos Nucifera (Coconut) Oil, Glycerin, Butylene Glycol, Ceteareth-20, Caprylic/Capric Triglyceride, Triethanolamine, Acrylates/C10-30 Alkyl Acrylate Crosspolymer, Chamomilla Recutita (Matricaria) Flower Extract, Lavandula Angustifolia (Lavender) Flower Extract, Disodium EDTA, Alcohol, Phenoxyethanol, DMDM Hydantoin, Iodopropynyl Butylcarbamate, Fragrance. I use the product daily. See above for comments. soaks into the skin nicely and it smells incredible. Best is mixed with coconut oil for anti-mosquito effect. I will never ve without this! I love this cream so much I use it every single day all over after I get out of the shower. This smells wonderful! I love it so much I bought 3 while it was on sale! Coconut products are the rage now, this one is very good, so fat my skin loves it. My mother and I love this cream. It smells fresh, produces smooth skin and lasts a long time. Loved it so much I took advantage of the sale to order 3! I will never be without it! I like this product. It smells good, if you like coconut. It feels good on you. My skin feels soft after i apply the lotion. I use this moisturizer all over my body. Love the smell. I live in a very dry area and need the extra moisturizing. Also, price. It moisturizes the best of anything I've used. Have used many products for dry skin and hoping this works better than most others...and that it doesn't stain clothing. Love coconut oil but have never bought the cream. I have only used the oils. Hope I love it. Nice fragrance and wonderful moisturizer!!! I like coconut oil. The price is great for the quantity obtained. this co. are good . 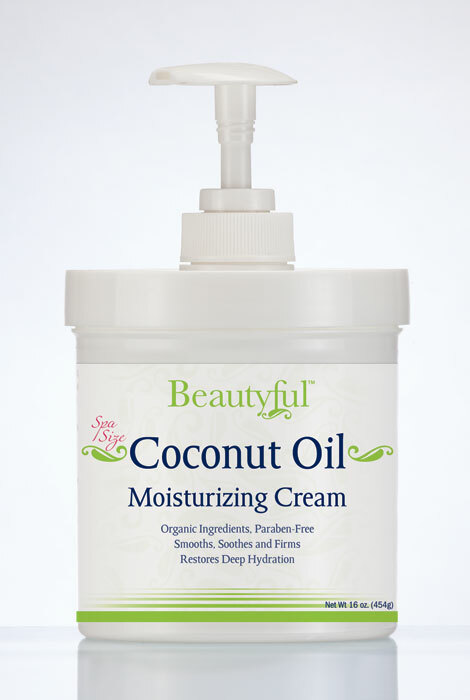 This is a great cream - just as moisturizing as you'd expect coconut oil to be. "I have another of the Beautyful creams and I love it. Plus the spa size is great!" My dermatologist and barber recommended because of dry skin. Coconut Oil is so versatile! Great price too. I love this product. My skin has improved in smoothness and overall appearance since I started using this product. use it at the present time and I like it. I have used coconut oil for a while and really like it. I have very dry skin. Especially liked having the pump, for sanitation purposes. The one I ordered before is almost gone. It is very moisturizing and it smells wonderful! good reviews, I needed a new bottle of lotion so I thought I would try this while on sale. This will be the third Beautyful product I'm going to use. I hope it will keep my skin moisturized and healthy looking throughout the long winter days. Wonderful product. Makes skin soft and glowing. To soften, moisturize, and firm my skin. Because it helps my skin and it goes on smooth and not oily or greasy. This is a great moisturizing cream and good for people with older skin as well. Living in the southwestern desert, I need all the moisture I can get. A friend of mine had it and I really liked it. Love Coconut Oil, and with Lavender is awesome. Skin Doctor recommended for pure moisture! BEST ANSWER: Thank you for your question. The Coconut Oil Moisturizing Cream's ingredients can be found on the website under the overview tab on the ingredients tabs. We hope this information will be of help to you. If I order this pump size and like it, does it come in pocket sizes to put in my purse? BEST ANSWER: Thank you for your question. Unfortunately we do not carry any pocket sizes for this item. We hope this information will be of help to you.